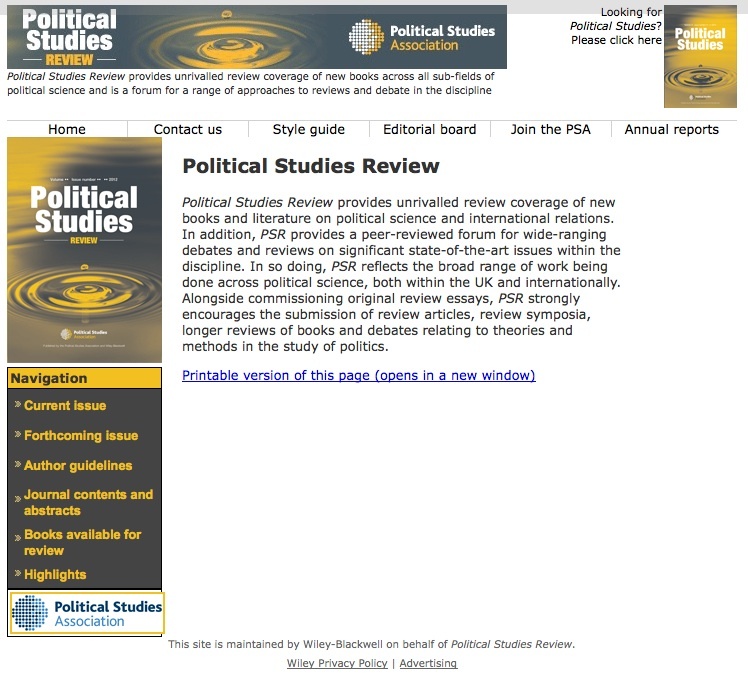 Launched and maintained by the British Political Studies Association, Political Studies Review is an authoritative database of new books and literature on Political Science and International Relations. Working in a timely and comprehensive way, the Association editors select 450-500 books a year for review, among the over 1500 titles submitted yearly. This website offers immediate and free access to every review published since January 2000. Often published months ahead of their book print publication, these reviews are divided in eight subject areas with monthly updates. An important feature of Political Studies Review is book-ordering in partnership with Amazon, with a direct link from the title of the book one is interested in. Also easily available are links to such features as Current Books Reviewed Online, How to Become a Reviewer as well as to Political Science Journal (paid membership required for full access) and the Political Science Guide with links to universities, associations and job opportunities. Recently Political Studies and Political Studies Review moved to the Department of Politics at the University of Sheffield, and a new editorial team is in charge to keep the site up-to-date.